I've written and published several books related to freelance travel writing. They are all available as digital products for immediate download. 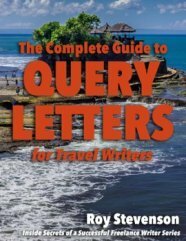 The Complete Guide to Query Letters for Travel Writers - This is my most popular book since every article sale begins with a query letter. In 118 pages, it tells you everything you need to know to craft compelling query letters, including 20 real query letters that I've used successfully to get assignments. You can use my query letter examples to create your own query letters and launch more quickly into selling your story ideas to editors. Each sample query letter comes with an explanation of what made it successful. I want you to be successful - so it's okay to steal my ideas and use them to sell your own travel stories! 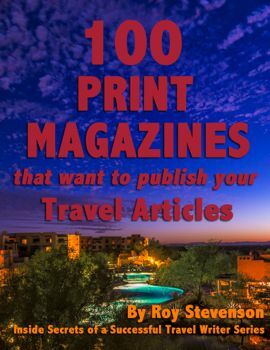 100 Print Magazines that Want to Publish Your Travel Articles is exactly that - a list of 100 print magazines that publishes travel articles from freelance writers. It's the list I use to sell my travel articles. This list will save you hundreds of hours of time - time you can spend writing and traveling instead! This book also includes a lengthy introduction (12 pages) about the best techniques to use to get published in print. And each item in the magazine listing includes a description of the publication, contact details and sometimes my own personal insights for certain publications where I have more information to offer. 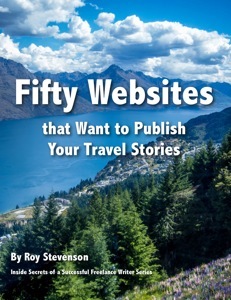 Fifty Websites that Want to Publish Your Travel Stories gives you a list of websites with contact details, website information, and insights. Writers just starting out can get published and rack up bylines quickly by writing for the web. Here's a list of fifty websites who accept stories from freelancers. This book also includes ten pages of guidance and tips about writing for the web and the multiple ways to benefit by getting some of your work online. 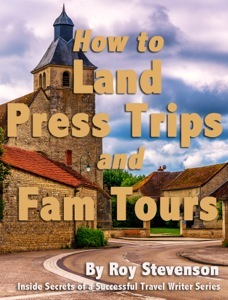 How to Land Press Trips and Fam Tours will explain everything you need to know to use your travel writing credentials and bylines to request free or discounted trips to practically any destination. You will learn about the different kinds of press trips, how to make important contacts, how to get on invitation lists for press trips, conferences that put you in touch with PR media and tourist reps, and so much more. Whether you're just getting started in travel writing, or need more information about how to land press trips, you will find a variety of ideas and valuable resources in this 75-page comprehensive guide.